Today I bought jeans for the first time since, probably, the Reagan Administration. I’m not exactly a clothes horse. A lot has changed since that time in the heart of the Levi’s period. There are a lot more choices now — too many choices, if you ask me. 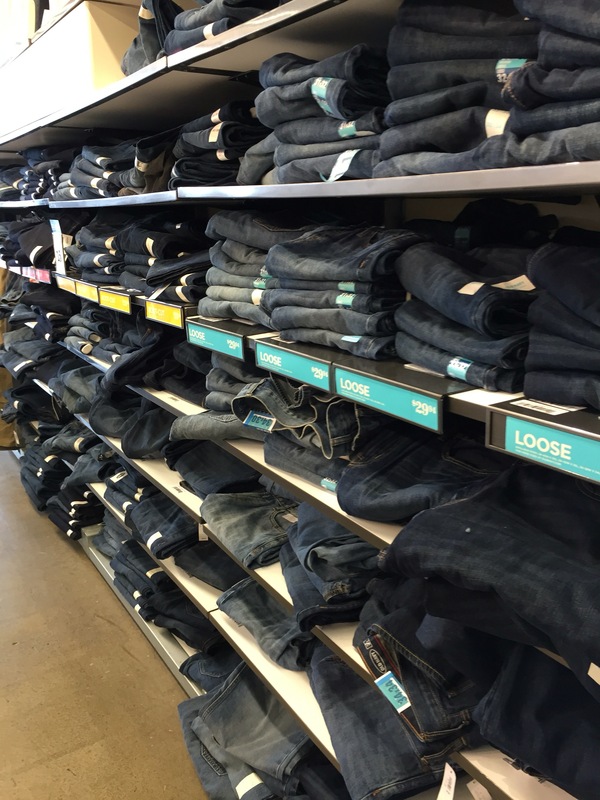 What’s a “boot cut,” anyway? Some Columbus restaurants from days gone by have achieved legendary status. The Kahiki, with its dry ice drinks and over-the-top Polynesian decor. The Jai Lai, with its big photo of Woody Hayes and its “In all the world there’s only one” slogan. The Chintz Room, located high in the Lazarus department store downtown, is one of the legends. Countless central Ohio kids of the ’40s, ’50s, and ’60s got dressed up and trooped into the Chintz Room with their grandmothers for a lunch break during a downtown shopping trip. There they self-consciously ate chicken salad in the company of prim, hat-wearing ladies, ever-mindful of the need to keep their elbows off the table. Now the Chintz Room is back. It’s still in the old Lazarus building, but now it’s moved to the ground floor with a street level entrance. 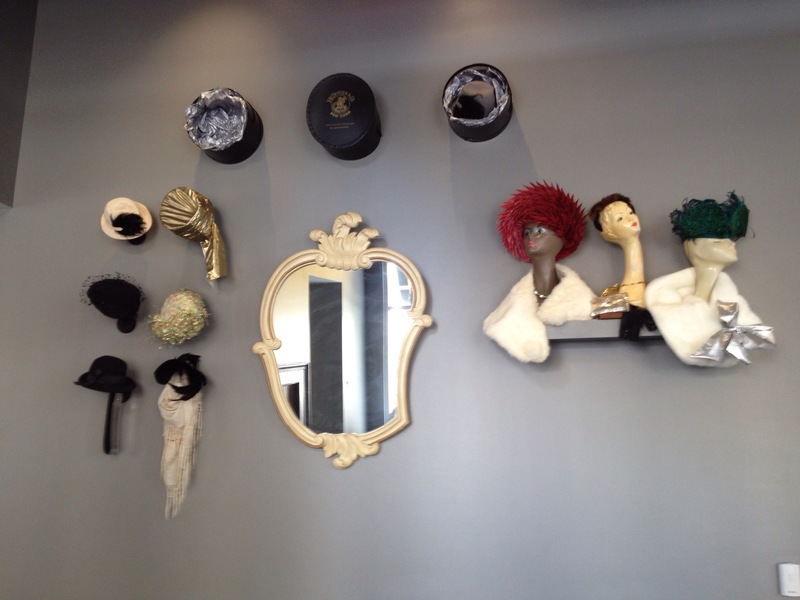 It’s decorated with mannequins, ladies’ hats, photos, and other memorabilia that recall its glory days at the center of the Columbus department store shopping world. And it still serves chicken salad, apparently made from the original recipe. I don’t like chicken salad, so it’s fortunate for me that the Chintz Room serves other, more modern options. 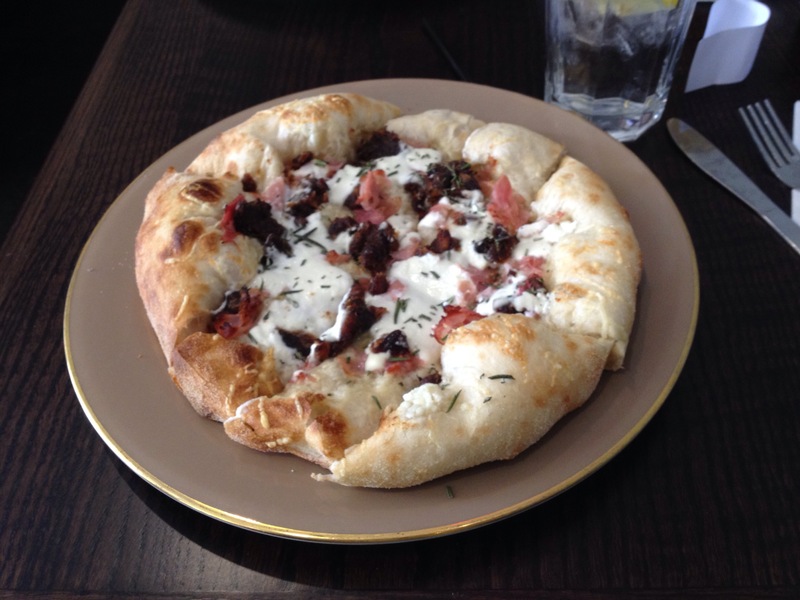 On my trip there yesterday with the Damages Dude — who did go for the chicken salad — I got the Tuscan pizza. It was excellent, with a crunchy crust, figs, prosciutto, three cheeses, and extra virgin olive oil, and large enough to satisfy a lunch-time appetite without being overwhelming. 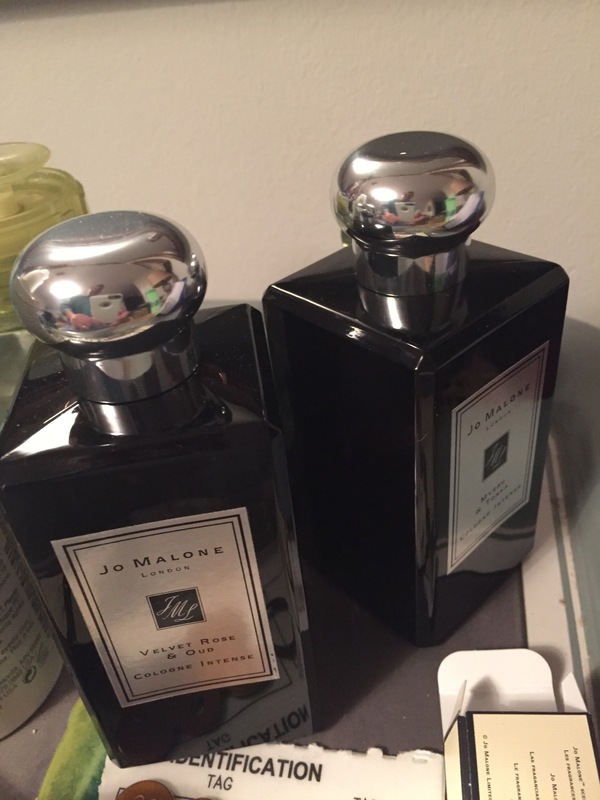 At $11.50, it’s price tag wouldn’t cause your grandma’s hat to go spinning off her head, either. 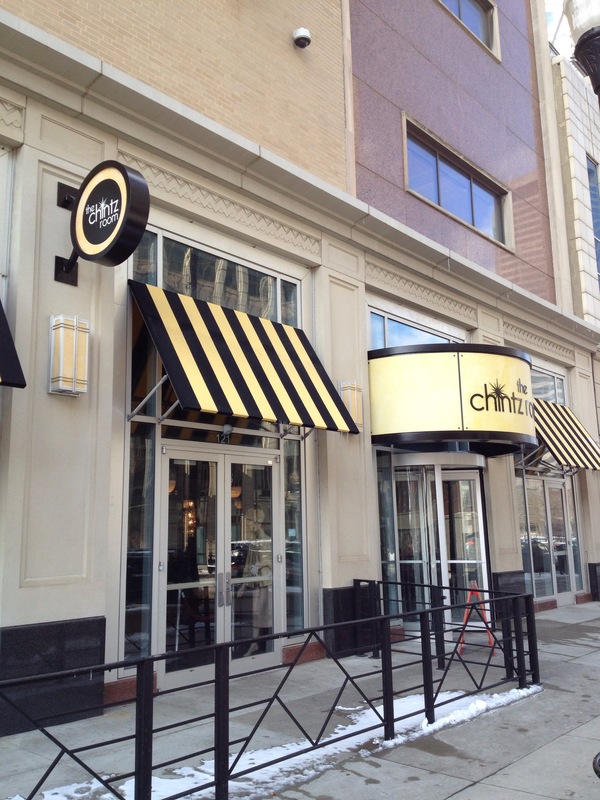 I’m glad the Chintz Room, with its echoes of Columbus’ past, is back and available for the downtown lunch rotation. On New Year’s Day, most of the London attractions are closed. Kish had done some research and thought it might be fun to head over to Camden Town, a London neighborhood that has become well known for its markets. 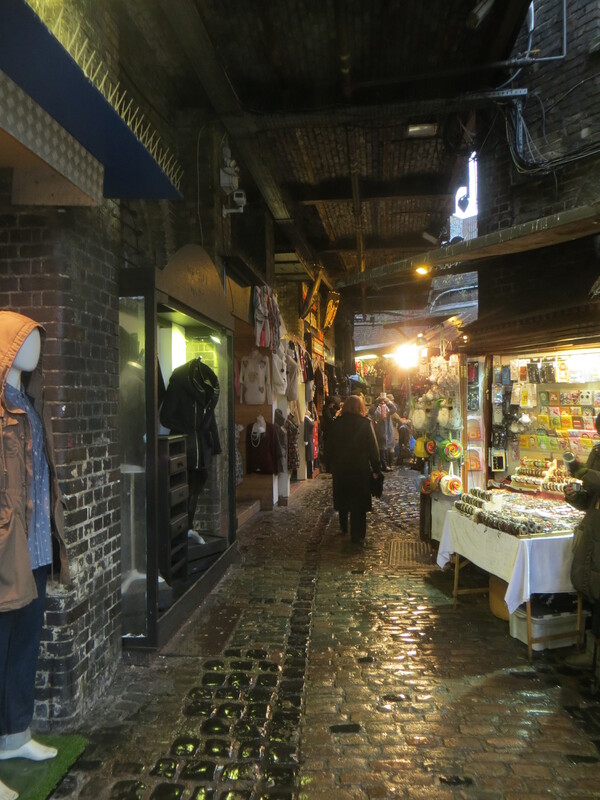 Two of them — Stables Market and Camden Lock Market — were open on a rainy, blustery day. 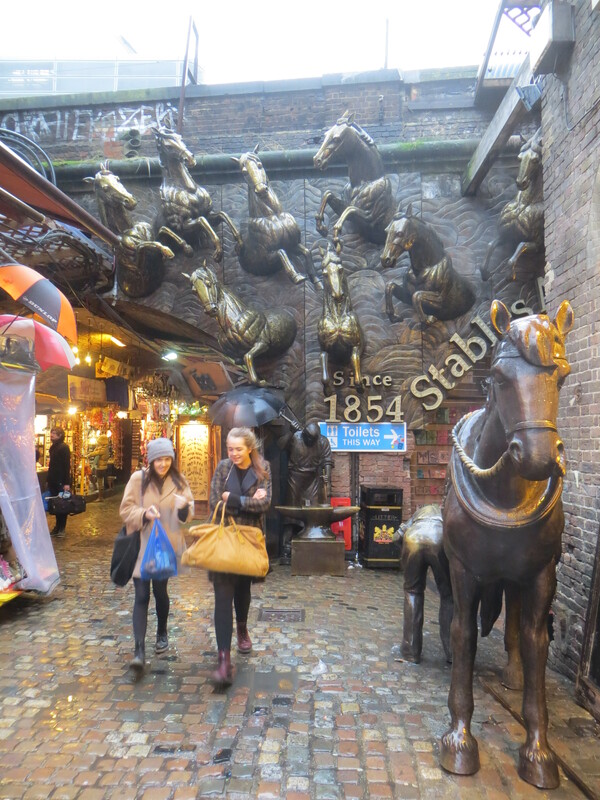 We visited Stables Market first. It’s located in and around an enormous, sprawling brick building that formerly was a horse stable. The signs of its former stable status are everywhere — in the cobblestones and horse troughs, in the curved bays and stalls, and in the many horse-related bits of decoration found just about anywhere you look. There are countless shops located in this elaborate brick maze. Ethnic food of every variety is available from stalls where the proprietors call out what they have to offer, and people ate standing up or sitting down, trying to grab whatever shelter they could from the downpour. Other shoppers dodged the raindrops going from stall to stall, some of which are pumping out music or drenching patrons in a heavy dose of incense. The non-food shops offered lots and lots of clothing, most of which seemed to be black and made for people who wear size 0 or smaller. There also were handbags and hats, bongs and hookahs, t-shirts and umbrellas, carpets and wall coverings, buttons and make-up cases, and a chance to have your photo taken wearing Tudor garb — and that’s just scratching the surface. The shoppers tended to be young and looked like they were having fun. 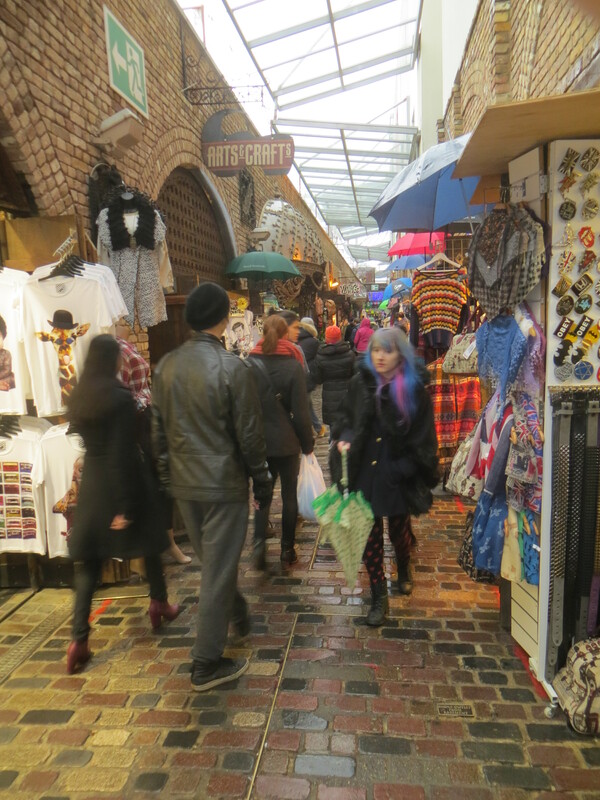 After we left the Stables Market we visited the Camden Lock Market, which runs along a canal lock underneath a bridge. 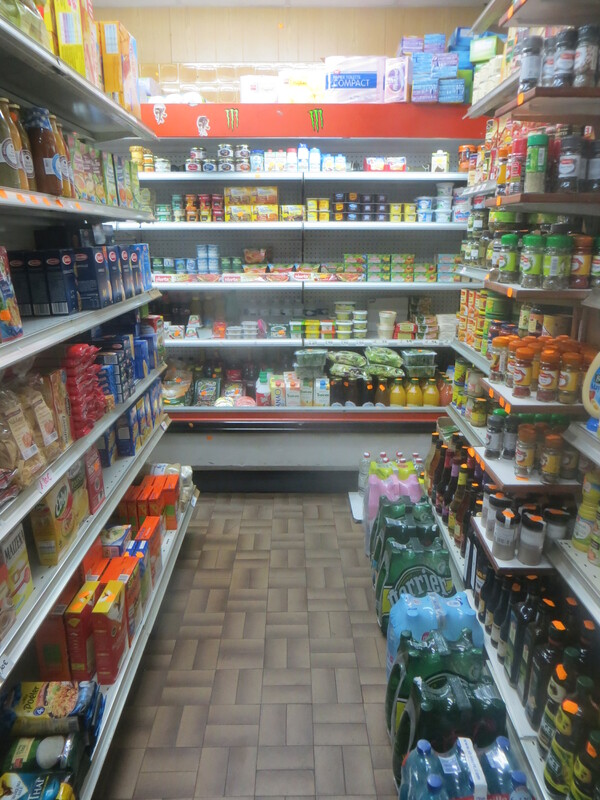 Its shops offered more of the same. We left without buying anything, but enjoying the dip into a different part of London and a better sense of what the young Brits are doing with their spare time.